Smartphones are everywhere right now, so it only makes sense that you would be able to trade on your mobile devices as well. Mobile trading has become really popular as technology becomes better and more brokers adapt their platforms to allow mobile trading. There are still a few small issues that some sites need to address, but for the most part, mobile trading is at a high point and provides a welcome opportunity for traders to increase profits while on the go. There are two main purposes of mobile trading that you need to be aware of, and both should only be used under special circumstances. Forex traders should download their broker’s mobile app so that they have the ability to trade when they are away from their computers. However, with most brokers, you should try to set up automatic trading conditions through MetaTrader 4 whenever you can, and use your mobile app merely for monitoring open trades to make sure nothing ever goes out of control. 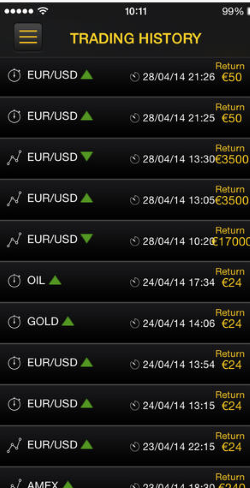 In this instance, a Forex app should be merely for maintenance and not for active trading. This is just far too technical for you to make steady profits trading without all of your tools readily available. That leaves the other purpose for having an app. This involves active trading, but it is something that you should be using mostly with binary options, although it can be effective as well in the stock market. The reason why mobile trading is so effective when it comes to binary options, though, is because of the fact that you do not need a lot of information to make an educated decision with binaries. You need to have a focus on direction and momentum, but the intricacies are not always important. You do need to understand these if you want to be successful long term, of course, but as long as you are doing prep work at home, you will be able to make a good decision based upon market movement while away. The same holds true with stock trading. You should have a price range in mind before you leave the house, complete with entry and exit prices written down for easy reference. You shouldn’t be trying to focus on more than one or two companies, and you should never attempt ultra short day trading strategies from your phone or tablet. Instead, just worry about only entering or exiting a position, and never try to do both unless an unusual circumstance comes up. Really, you are just trying to increase your exposure to the market and not use mobile trading as a replacement. Ideal situations should be in place before entering a trade, and your phone is just a convenience that allows you to leave the home once in a while, and not a crutch. Your home computer setup should remain your main station, but if you absolutely need to, you can use your phone on a once in a while basis. Starting mobile trading differs a little from broker to broker. Their sites should have a little icon to click on which will take you to an outlet where you can download the app. It will usually be either the Google Play store (for Android devices) or iTunes (for Apple). Apps are always free of charge since you need to have a funded account to use them anyway. Once the app is downloaded and installed, you will need to provide your login info that you were given by the broker when you originally signed up. Most brokers will not allow you to create an account or commit any account funding transactions from the app, including withdrawals from your account to your bank. This is for your safety, although it can provide a small inconvenience. Just make sure these things are taken care of before you leave the house if they are necessary. Mobile trading is a great opportunity to increase your profits, but be smart and do not overuse this luxury.